U.S. 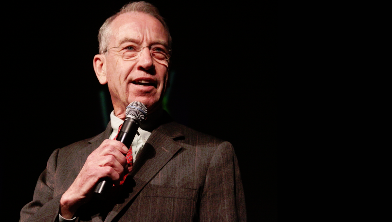 Senator Chuck Grassley is well-known for common sense and staying connected. Grassley holds an annual meeting for every county in Iowa to foster the process of representative government. In Washington, he holds the longest record for not missing a vote among current Senators. Grassley chairs the Judiciary Committee and also serves on the Budget and Agriculture committees. He also chairs the Senate Caucus on International Narcotics Control and co-founded the Senate Caucus on Foster Youth. Senator Grassley holds a meeting in each of Iowa’s 99 counties every year to keep in touch and foster an active dialogue with constituents. In addition to these meetings, when Senator Grassley is in Washington, D.C., he holds telephone town halls. These hour-long, question-and-answer sessions by telephone are open to all Iowans. Senator Grassley welcomes questions and comments on any subject. Sign up here to register and receive a call for the next one.